This program allows you to create a brand new PDF file from an existing document (or another file type) that can be printed. Doro::Free PDF Printer operates as a virtual printer and will save files sent to printer in PDF format. A virtual PDF printer doesn't print anything on paper, that's why is called "virtual", but is using libraries associated with printer's drivers to generate the PDF. So, do you need to have a physical printer? No. 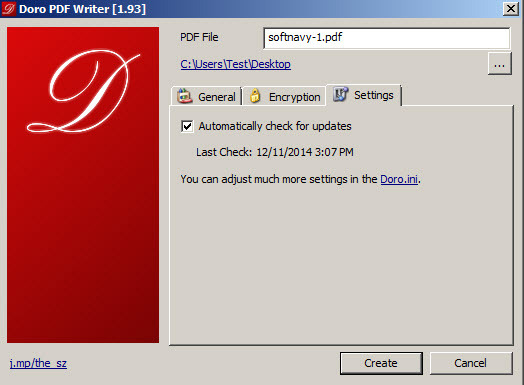 It's enough that your file to support print command (Ctrl+P) in order to save it as a PDF by selecting Doro as printer. In this way, you can convert to PDF different files such as Word, Excel, images and more. This software allows you to encrypt the PDF with a password and restrict or not some editing rights such as copy and paste. You can set metadata information like document title, author and more. Doro PDF Printer is available as free download for Windows 32-bit and 64-bit. Doro PDF Printer is 100% clean and safe to install. You can see the test results here.